High-performance email marketing solutions at competitive prices. Choose the plan that’s right for you. Recommended for beginners. 1000 E-mails free every month. Recommended for everybody who wants to grow. Recommended for experts. Dedicated IPs included. Offers are aimed at commercial customers. All prices are in U.S. dollars plus 19% VAT. View our prepaid offers here. 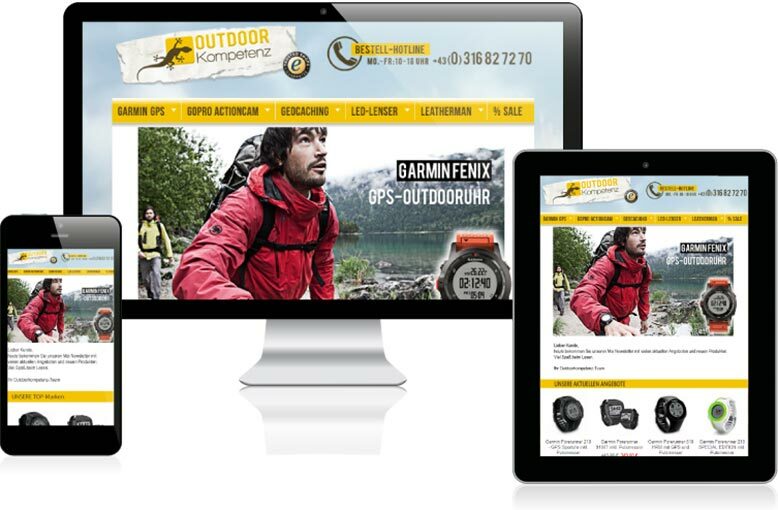 Get responsive premium templates with e-commerce plug-ins if needed (1-click product transfer). If you do not currently have an email design in mind for your template, you can order template design consulting – we’ll design it for you. If you already have a design that you’d like to use, send it to us via email. We program the template according to your specifications. The price includes two rounds of revision. Once you’ve approved the design, we’ll upload the premium newsletter template into your Newsletter2Go account. The above process takes between 7 and 10 working days on average. Check out examples of custom templates. You can edit and change text and images in your template even after it has been fully programmed. If you’d like to have a premium template in your own corporate design as an alternative to our free templates, we’re happy to create one for you. We can handle both the designing and programming of your template. Or, if you already know exactly what you want your design to look like, we can just do the programming. Check out some examples of premium templates here. Make sure your customers recognize you. Utilize the power of branding. Do you want your corporate design, colors and logo to be the very first thing your customers see? Customize every page that your contacts visit with your corporate design. From the first registration page to the last page after a user has unsubscribed – all of these pages can be personalized. Take advantage of automated unsubscribe management. Error pages, for example after a failed registration, will also be automatically adapted. The website will be in line with the company’s preferred fonts and colors. You can even personalize the unsubscribe questionnaire. Read more about custom registration and unsubscribe pages here. How much does it cost to send emails with Newsletter2Go? Our Lite Plan allows you to send up to 1,000 emails per month for free. If you want to send more emails a month, you can select a plan based on the volume of emails you send and the features you want. You have a choice of three different plans: Lite, Standard and Pro. These plans differ in terms of features and service. You determine how many emails you want to send. Can I also connect Newsletter2Go’s email marketing software to my e-commerce shop via an integration? Newsletter2Go has many integrations and plug-ins for e-commerce, CRM, and CMS systems. This feature is available with all plans. If there is no integration available for your specific system, an integration can also be set up manually via REST API. No, there’s no fee to set up your account. It’s completely free to start an account, and you do not have to enter payment details until you actually order something. Can I change my pricing plan and the number of emails I’m allowed to send? You have the option to change your plan at the end of a year or at the end of a month (this depends on the billing period you set up initially). You can upgrade to a higher plan or increase the volume of emails you send at any time. Billing will begin at the time of booking. If you choose a monthly payment system, your contract has a one-month term. For annual payments, the contract period is one year. It is possible to terminate your account. Terms of termination will depend on your individual contract period. All nonprofits receive 25% off our standard prices. Curious? Try It Out Now! It’s free to create an account and start using our email marketing software. It’s completely risk-free!